Selva Capuzza is a family run estate producing wines in three distinct DOC appellations: Lugana, San Martino della Battaglia, and Garda Classico. The three DOCs overlap in this area. This is the only winery in the area which produces the three of them. The Formentini family is proud to work only with native grape varieties – you won’t find any Merlot or Chardonnay here! The white varieties are Turbiana (which is the main grape in Lugana) and Tuchì (for San Martino della Battaglia). The red and rosé wines are made with: Groppello, Sangiovese, Barbera and Marzemino. The estate’s wines are all made in the cellar, situated between Cascina Capuzza and Borgo San Donino agriturismo. It was built on purpose in 2001 to accommodate all the phases of winemaking, from the pressing of the grapes through the vinification and aging to bottling. All our wines are made by a team led by Luca Formentini, with the help of a cellarman, a winemaker and an agronomist. Cellar visits and tastings are possible by appointment. All of Selva Capuzza’s wines are available for tasting and can be bought from the Wine Shop at Cascina Capuzza. The design is obtained from the older decorative element we can find in “ Cascina Capuzza”. 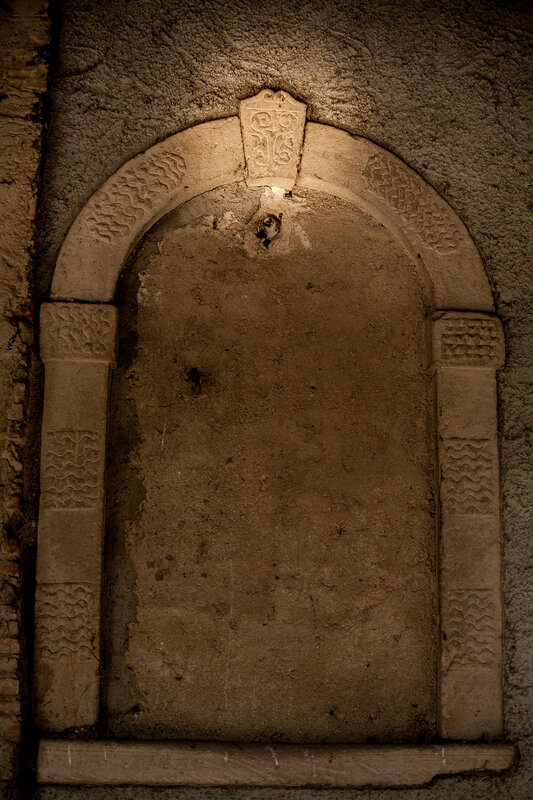 It is about a stone portal, maybe dated XVI century, present on the external wall with a keybrick which has a bas-relief of two flowers upside down from each other. There are also two curvy lines closed in a curl which separates them. Two lateral beams have more simple decoration, some wavy lines which may represent the water. It is difficult to understand if this drawing refers to the lake or about the presence of ponds around the farmhouse.